David and Nancy Harleman of Harrisonville, Mo., like nothing better than getting on the water, putting a couple lines out, and relaxing in nature. But as they approach retirement, they wanted a boat that would cost less to run than their 19-footer with a 200-hp outboard. 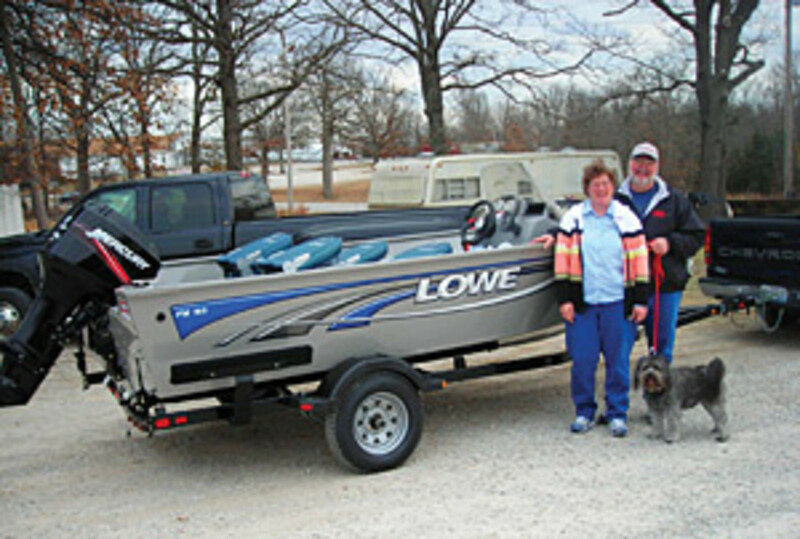 Last month, they purchased a new Lowe FM165 with a 50-hp Mercury from Angler&apos;s Port Marine in Warsaw, Mo. "First of all, we were looking for a deep-vee hull," says David Harleman, 57. "And a bass boat is shallow, which makes it easier to get into." Harleman is a maintenance technician for Harley Davidson and has been a boater for much of his life. He and Nancy, 52, love to fish on Lake Truman, which is a little more than an hour from home. He decided to replace his 19-foot bass boat because he wanted something more fuel-efficient and thought it was a good time to take advantage of the deals being offered. "Our old boat had a 200-hp Mariner outboard," says Harleman. "It just ate up so much fuel. It would cost $100 just to spend a day out on the lake, between trailering it and then going out on the water." The Harlemans attended the Kansas City Sportshow in early January and met some representatives from Angler&apos;s Port Marine, which is owned by Dennis and Linda Morgan. They were looking for something along the lines of the 16.5-foot bass boat with a 50-hp Johnson they had owned a few years ago but lost in an accident. "They were all very friendly and helpful, very down to earth," says Harleman. "You couldn&apos;t ask for better people." They began exchanging e-mails about the type of boat they were looking for and available financing options. The Harlemans were putting no money down, and the dealership gave them a "show special" of around $13,000, even though they bought it a month after the show. Harleman says it was easy to get financing with their good credit, and he was able to sell his old boat to a relative before purchasing the new one. "We love being outdoors and on the water; fishing is very therapeutic," says Harleman. "There&apos;s nothing better than sitting out in the boat, hearing the sounds of nature, eating a sandwich, and just talking casually. It&apos;s a great way to reconnect." "I think people are getting tired of all the negative talk and need something to raise their spirits and boost their confidence in the way things are going," says Harleman, referring to the state of the economy. "I think the spring weather can be a boost to everybody&apos;s morale. I am a half-full type of person."